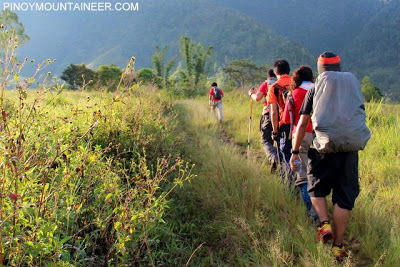 CAMIGUIN – I have always thought that any mountain that can be done as an overnight climb can also be dayhiked. So far, this theory has been vindicated by countless examples; people have dayhiked Pantingan Peak, Balingkilat, Tapulao, and even Apo – things that were previously unheard of. 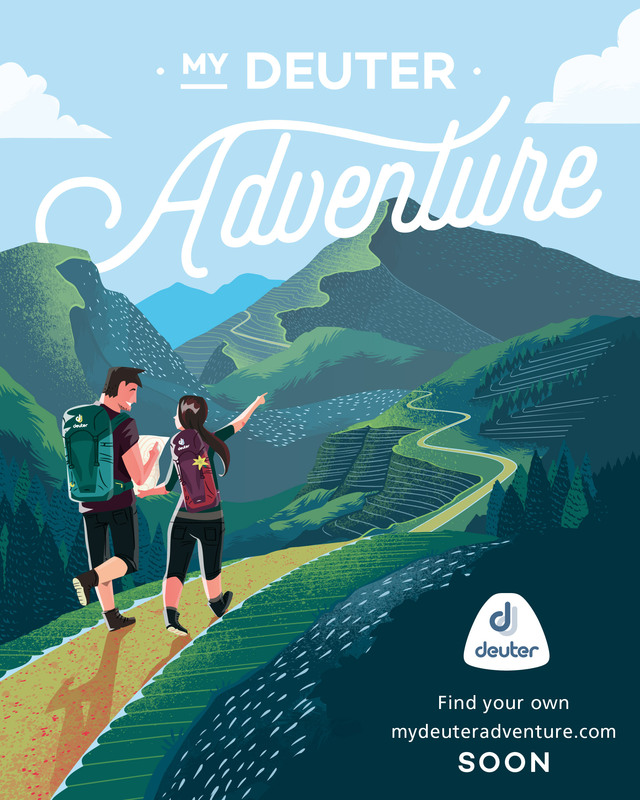 On the other hand, my good friend Koi Grey, who is a very talented young hiker, has pushed things even further and has even done a 14-hour Guiting-Guiting Traverse. His theory is any mountain that can be done in three days can be done as two. His 360 Adventure Team just did what he calls the ‘three epic traverses of Mindanao’ and in fact he did the Sumagaya-Lumot leg in two days. 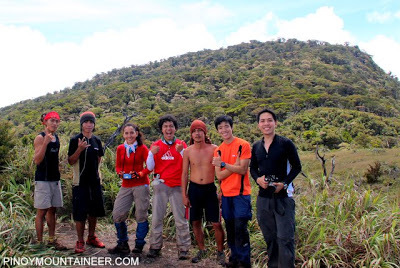 Combining our two ‘theories’, we decided to embark on a Sumagaya-Lumot Traverse Dayhike when we arrived in Lumbia airport in CDO on May 4, 2012 to celebrate my birthday with a memorable Mindanao climb. Koi took it upon himself to organize the climb, and we were joined by our friends Coby, Farah, Lance, Jeshua, and met in CDO by our guide, Pong. So on that same day, after getting supplies, we headed to Claveria and stayed at the house of the very hospitable Mayette, who has become the point person for the trilogy in Misamis Oriental of Sumagaya, Lumot, and Balatucan. I thought, “Finally, I’m getting to climb Sumagaya-Lumot!” Last year, I had to abort a planned climb with JohnMurs because of security issues. On May 5 early morning, we took a rented jeepney to Brgy. 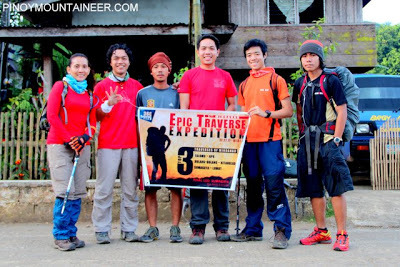 Mat-i, Claveria, to commence the attempt for a traverse dayhike. 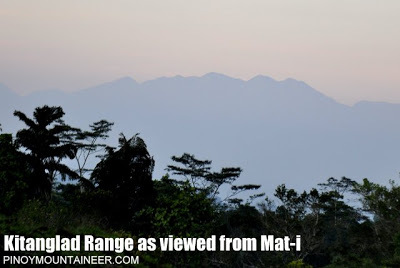 Along the way, we were blessed with splendid views of the Kitanglad Range, of Balatucan, and of Sumagaya itself with the breaking of the dawn. 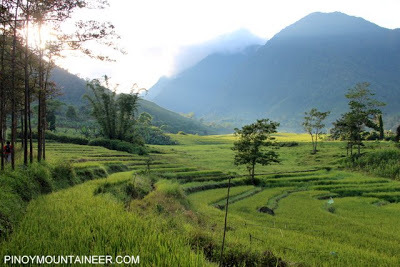 We started trekking at 0610H, and reached a village in around thirty-five minutes. Past the village, which offered scenic, pastoral views, the trail became somewhat steep and open, with beautiful grass that one of us likened to the finale scene in the movie ‘Gladiator’. 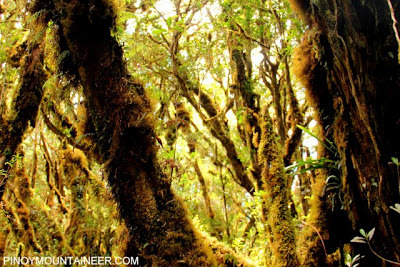 We then entered a forest which offered pleasant, established trails akin to those of Isarog, or the forests of Mariveles. 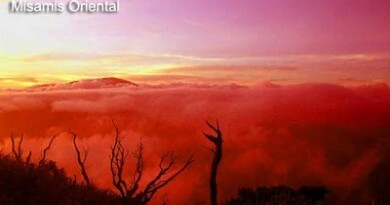 We had aimed at a 1000-1100H arrival at the summit of Mt. 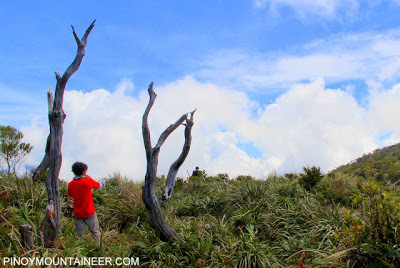 Sumgaya, but since we had no idea how the day will turn out, the idea of a dayhike being unprecedented, we were trying to hurry and by 2145H, we emerged from the forest and found ourselves at the summit! Koi pointed to a stump of a tree that he said was the definitive landmark for the summit. This and the other dead trees reminded of Mt. 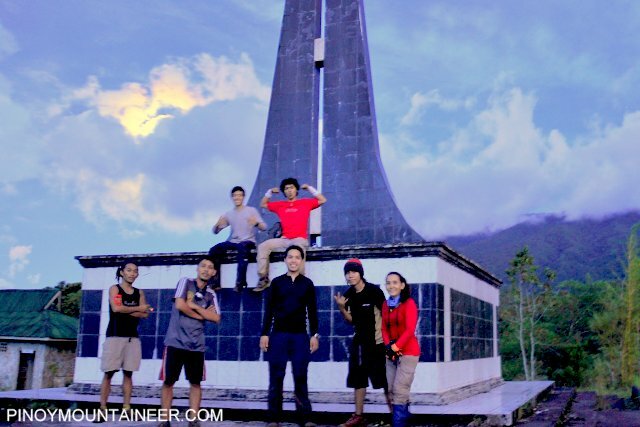 Wiji, in Kalatungan; everybody promptly went up that stump, as a personal memento. Had we opted for the three-day IT, we would have been camping in that place! Past the summit, where we rested for around 30 minutes, we headed towards Mt. 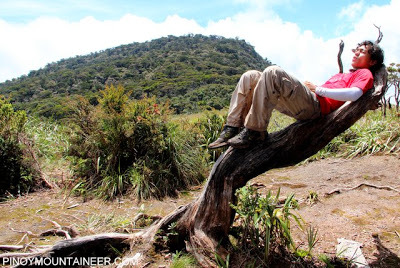 Lumot, and instantly, we were mesmerized by the mossy forest that earned for it its name, which literally means “mossy mountain”. 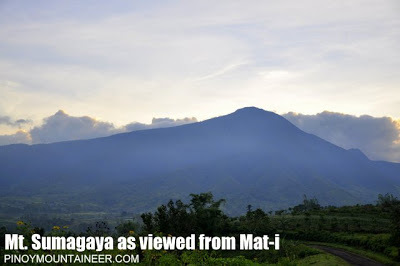 Sumagaya and Lumot are not separate mountains; they are actually contiguous, even if they are separate peaks, they are not as independent of each other as Kitanglad and Dulang-Dulang, or Talomo and Apo. 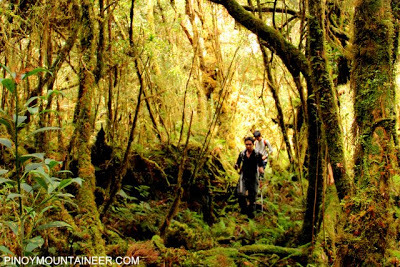 The trail system does not reach a discrete peak within Lumot; the highlight is diffuse: the whole mossy forest trek is the attraction of this mountain. 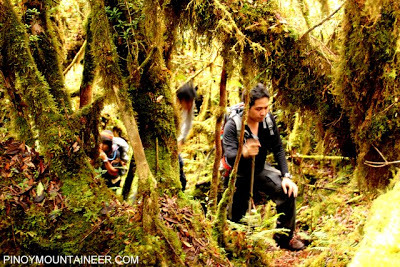 I have treked through several mossy forests around the country – Mt. Napulauan, Mt. Talinis, Mt. 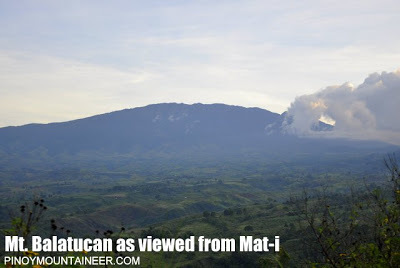 Dulang-Dulang, and Mt. Kalatungan among them. But I have to give it to Mt. Lumot for being the mossiest of them all. 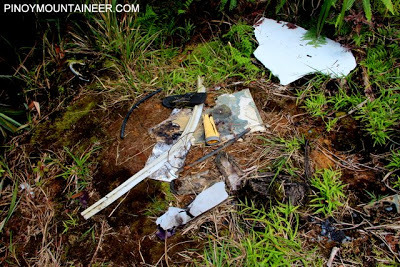 Meanwhile, the clock was ticking, and inasmuch as we would have wanted to stay longer in this mossy realm, we aimed for a 1400H arrival at the crash site of the Cebu Pacific Flight 387. The stories and myths surrounding this incident have since become part of the folklore of the people. Pong said that that 1400H, which was the time when the crash was said to have happened, is a particularly eerie time to be at crash site. Past the crash site, the mossy forest continued, and so did the obstacle course of branches, roots, and loose soil, which caused many a curse to be ejaculated in that forest. Fortunately, none of us had any injuries! We emerged from the trail into the rough road at 1720H, and at exactly 1810H, 12 hours after we started trekking, we were at the shrine, just as the supermoon (it was May 5, after all) was rising to its glory…success! We spent the evening on a hut near the shrine, celebrated with the food we have left, and had a nice sleep, lulled by the cool winds of the mountain.